CAMBRIDGE — The makeshift display secured into the wall glows and pulsates, creating a hypnotic aura like a lava lamp for the modern-day engineering student. But more than that, it pinpoints the whereabouts of the MBTA’s many trolleys and trains. Inspired by his love of public transit, Massachusetts Institute of Technology junior Ian Reynolds has built onto his fraternity room wall a map of the T that shows real-time locations of the vehicles using vibrant LED lights. For three weeks, Reynolds tinkered with electronics, fiddled with power tools, and manipulated strips of bright bulbs to create the map that stretches across his bedroom wall like a spidered windshield. 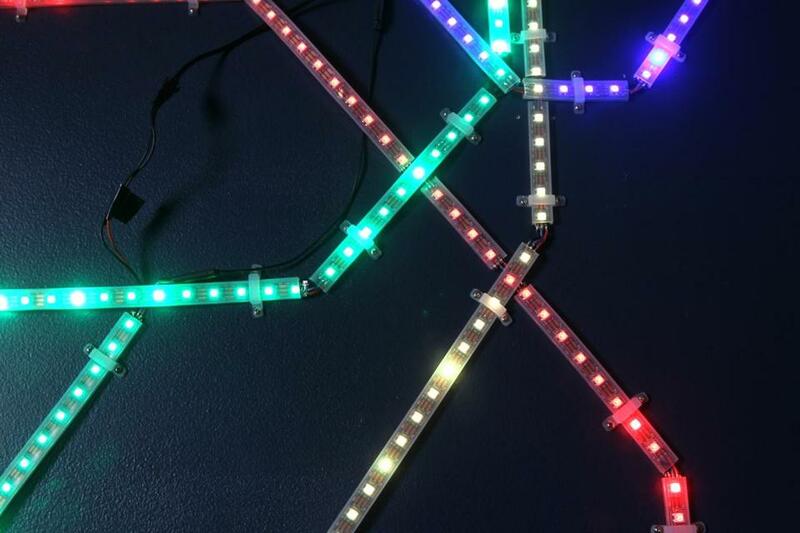 The most difficult part of the project, he said, was shaping and soldering the 29½ feet of Adafruit NeoPixel light strips. “The strips don’t bend laterally, so where there is a curve in the map, I would have to break the strips” and reshape them, Reynolds said. The strips are driven by an Arduino Uno, a circuit board used for programming that reads information from a Python script. The script runs on a tiny computer called a Raspberry Pi that rests on his floor. The Raspberry Pi is commonly used for such do-it-yourself electronic projects, he said. LED lights indicate where MBTA trains are in real time. The system setup takes data from the MBTA’s API, a feed the MBTA makes available for third-party developers that includes information on the location of trains in the system. Information is grabbed from the MBTA every 10 to 15 seconds, causing the colored lights, which match the colors of the transit lines, to blink based on the vehicles’ approximate positions across the Boston area. As the tasks mounted, he enlisted the help of friends and roommates to get the job done. “People found out I was doing it, and a lot of them had way more experience with the physical hardware, so they helped with installation,” he said. Reynolds documented the building process in a lengthy post on Friday on the self-publishing website Medium, and then later shared the project details to Reddit. In terms of letting the MIT student know when to dash out the door to catch a train, it’s not very useful, he said. But it does add pizzazz to his living quarters. Plus, it was fun to build and program. “It’s just something that makes the room look nice,” Reynolds said. While the map on his wall is mostly true to form, he explains that he didn’t include the Silver Line and the Ashmont-Mattapan trolley line. The map is based on a redesign of the T system map by independent designer Cam Booth. Since the MBTA began making the data available, developers have created similar maps that exist only on Web pages. The data have also been used to create a number of smartphone apps that people can use to tell when their train or bus is coming. When asked if he plans to add the commuter rail lines to his display, Reynolds said he wouldn’t have enough room for the expansion. Reynolds once lived in Salem, and later in Swampscott. His family moved to Minnesota when he was 9 years old. Since moving back to the area to attend MIT, his fascination with public transit — specifically the MBTA and its history — has grown. With a concentration in electrical engineering and computer science, and an interest in the aging trains and trolleys, taking on the project felt like a suitable tribute to a place he was happy to return to. And now it’s part of the fabric in his room, too. 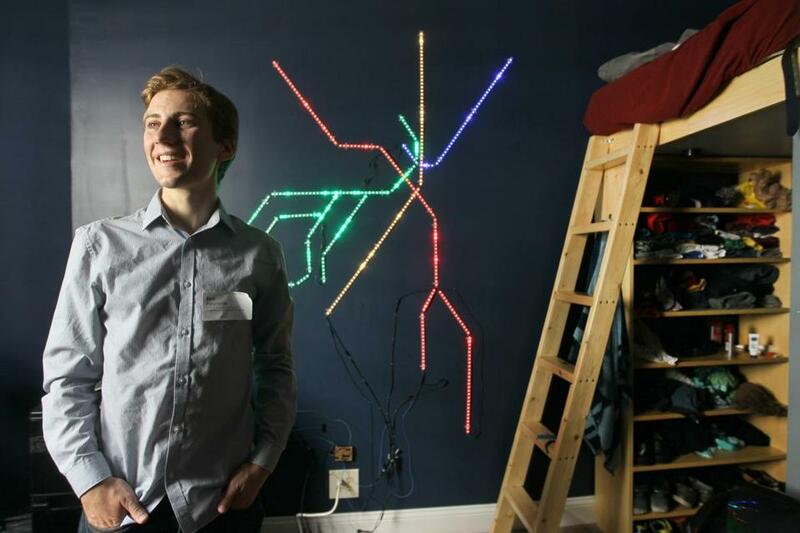 MIT student Ian Reynolds built an MBTA map on his wall in his room.